Dr. Roya Javid of Coastal Valley Dermatology Associates is proud to be one of the first to offer Kybella – a prescription injectable treatment to improve the appearance and profile of moderate to severe fat below the chin (submental fat), also called “double chin" or "turkey neck”. Kybella can help eliminate submental fat and provide your chin and jawline with definition. Kybella injections are made up of deoxycholic acid, a substance naturally found in the body that aids in the breakdown of fat cells. It is non-surgical, and results appear over the course of one to two months for more natural-looking, gradual fat loss. Kybella is the first and only FDA-approved injectable treatment that contours and improves the appearance of the “double chin” or submental fullness. In 2016, Kybella was honored with “Best of Beauty Breakthrough Award” by Allure Magazine and the “Most Innovative New Product” at the Beauty Choice Awards by New Beauty. This innovative way to remove those small, stubborn patches of fat deposits on your body through Kybella injections are safe and effective when done by a skilled physician who understands the skin and anatomy. It will likely take several injectable sessions to target these fat pads on your body, but the convenience of no downtime and no surgery are great advantages. 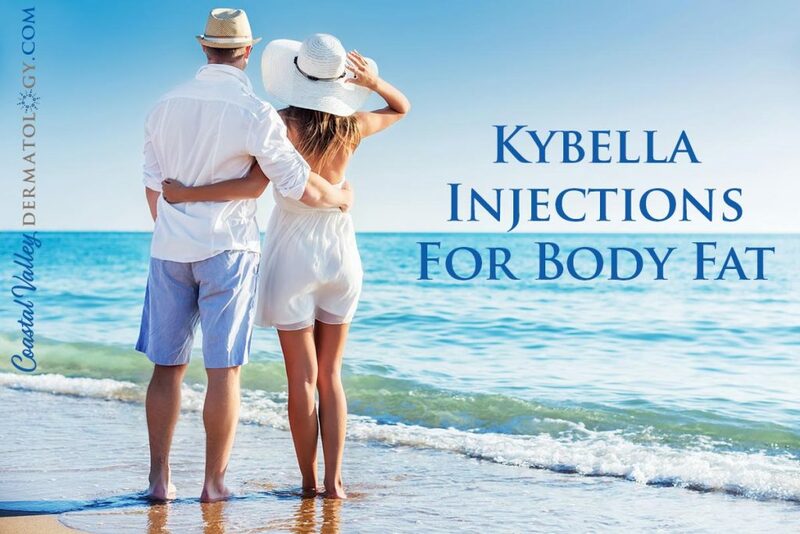 Kybella™ is a synthetic formulation of deoxycholic acid, a substance found naturally occurring in the body, which is synthesized and then used to break down and absorb dietary fat. Kybella™ has been under development for more than 9 years, and has been the subject of over 20 clinical studies involving more than 2,600 patients. When properly injected in the submental area, it has been shown to dissolve fat that causes a double chin. The result is a more streamline neck and improved contour along the jaw line. Are the results of Kybella permanent? The short answer is yes. Because this is a recently introduced treatment, there are not yet enough patients who have received Kybella™ injections to completely substantiate that claim. However, the clinical findings of the FDA studies indicate that the results are permanent if there are no significant lifestyle changes. How quickly will I see results from Kybella? Everyone’s reaction is different. The fat is dissolved within 10-15 minutes of injection, however your body has an inflammatory response to the injection, causing swelling, and this can take 3-4 weeks to subside. Typically, results will appear within 4-6 weeks, and will continue to improve as additional treatments are administered. Kybella is administered by injections into the fat under the chin through a series of treatments spaced 4-6 weeks apart. The treatment plan is tailored to meet the individual needs of the patient. The total number of treatments can vary based on a myriad of factors. Patients may need 2 – 4 treatments to achieve their desired results. Dr. Javid will determine the best regimen during your consultation based on your age, anatomy, physiology and goals. How long does a Kybella treatment take? Kybella is an injectable treatment, similar to Botox and fillers. It requires a relatively short office visit with Dr. Javid that should take about 20-30 minutes. Is there any downtime after getting Kybella injections? There can be some bruising and swelling following Kybella treatments, similar to other injectables, and can last up to a week. The bruising can be easily covered with make-up as soon as the next day. The swelling at the injection site typically lasts 4-7 days. Dr. Javid advises her patients to wait a few days before returning to the gym. Any strenuous activity can prolong swelling and increase bruising. What causes submental fat (double chin)? Who is affected? The major factors seem to be genetics, natural aging or weight gain. Having a double chin can cause you to look older and heavier. According to a 2015 survey by the American Society for Dermatologic Surgery, approximately 70% of people have reported being bothered by submental fullness. What other options exist to reduce fat under the chin? 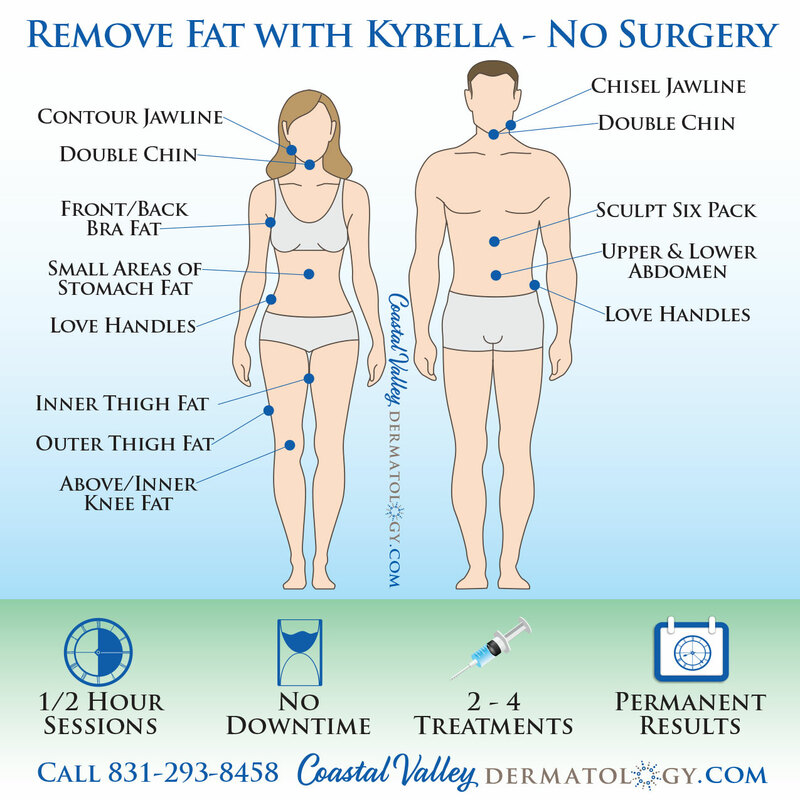 Prior to the introduction of Kybella, the only effective option to treat submental fat was done surgically. Liposuction, chin implant, platysmaplasty and neck lifts are all techniques utilized to improve the appearance of a double chin. During your consultation, Dr. Javid will thoroughly discuss the different treatment options available to you and answer your questions. What if there is subsequent weight gain following Kybella injections? Patients in the clinical studies who experienced weight gain after their treatment did not see the return of their submental fullness. However, we will have a better understanding about the impact of subsequent weight gain in the future when data becomes available from a broader range of patients who receive treatment with Kybella. The side effects reported from Kybella injections were comparable to other cosmetic injections such as dermal fillers, leading the FDA Medical Advisory Committee to unanimously recommend approval after reviewing the clinical data. 17 to 0 were in favor to be exact. In extremely rare cases, improper injection could damage skin tissue if injected outside of the approved area (submental fat deposits). An injection too close to the marginal mandibular nerve could cause injury that affects the appearance of the mouth. While side effects resolved on their own within 1-2 months of treatment, to minimize risks it is recommended that Kybella be injected by a physician as they have extensive experience with the nerves of the face and knowledge if you are a candidate for injection based on your anatomy. Kybella may not be appropriate for everyone. Patients who have undergone previous plastic surgery procedures of the neck, chin and jawline must be evaluated on an individual basis. Patients who have difficulty swallowing, bleeding problems or medical conditions that might affect the face and neck may not be good candidates for Kybella.